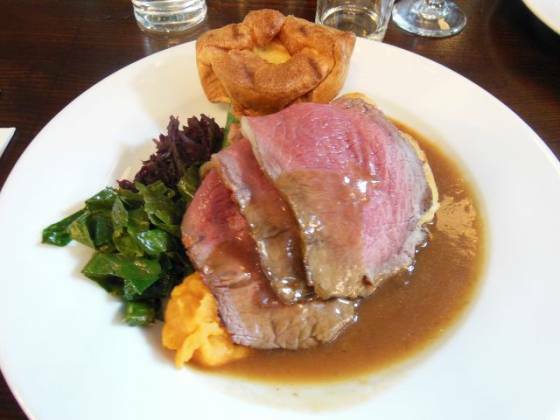 I received an email from a reader recommending The Lord Northbrook Sunday lunch. It came at the right time as I completed the House on the Hill review and pondering where we could next visit. A quick call on the Saturday for the following day and we were all set. We parked down the street, and walked with the pram. The pub is situated on a main road, with two entrances, one being a single door and not suitable for a pushchair, the other a double door, of which we had help with getting it through. Positive first impressions, the venue felt fresh, light and breezy. The bar was straight in front of the doors, and we ordered drinks (soda water for Claire (free) and an Amstel (£4.00)). We were shown to our table near the back before reaching the conservatory. The venue itself was decorated nicely, with old adverts and pictures on the wall. The table was already laid out, including salt and pepper in small jars with a teaspoon on top, and we were given menus. A side note – the men’s WC was all black slate, handwash and hand moisturiser with Harry Potter audio book over the speakers :-) Our seats were comfortable, with space for John William in the push chair (I told them on the phone we required room for him). I noticed many parents with babies – definitely one that’s popular with the families around Lee. The menu choices were interesting, I was so very tempted with their sharers – a whole hog! We decided to forgo starters (which sounded amazing) and went straight to main courses. Claire ordered the roast beef, I asked for the roast lamb. Our Sunday roast came out quickly – it was presented well, with the meat draped over the rest of the food. Hiding underneath were roast potatoes, vegetables and stuffing. Claire also had a Yorkshire pudding with her roast beef. Tucking in, the roast lamb tasted good – lots of it and cooked well. Claire was put out that they served the roast beef rare. It was extremely pink – I sampled the beef and enjoyed it. This meant Claire left quite a lot of meat on her plate, I would preferred them to have asked how she’d like it cooked (or state on the menu that it was cooked rare). 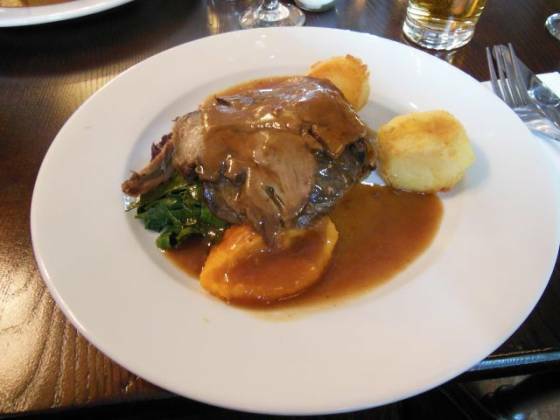 We had 3 sizeable roast potatoes each, they were cooked properly – I believe Claire remarked about how nice they were. The vegetables consisted of greens (tasty), red cabbage (tasty) and puréed something or other (not tasty) – I don’t enjoy puréed anything with my roast dinner! I tried Claire’s yorkshire pudding – it seemed freshly made, as did the stuffing. The gravy had a good flavour but I would have preferred some more – I’m sure they would have provided extra. So, a good Sunday lunch with a couple of issues – one being the roast beef being cooked rare instead of by request, and the puréed vegetable. 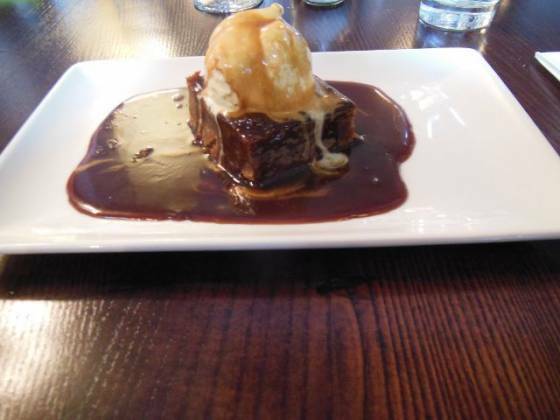 I just had to give the dessert a go – interesting options including passionfruit pavlova, sticky toffee pudding or the chocolate fondant and caramel sauce (all around £4.75 – very reasonable). I have started to ask the waitress / waiter for recommendations – this time, they immediately said the fondant. My dessert was served after around 10-15 minutes – once again, good presentation. 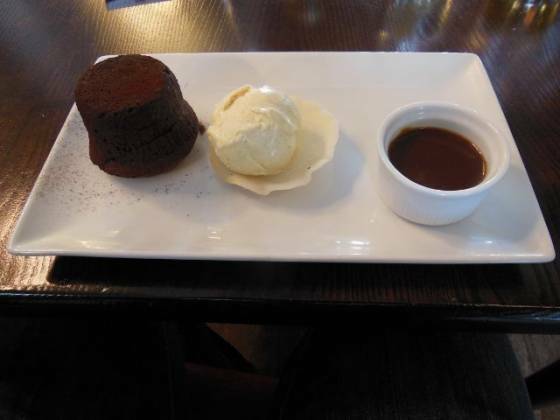 The chocolate fondant pudding on one side of the square plate, a spoon of ice-cream in the middle, and caramel sauce on the right. The ice-cream and caramel sauce was nice. I started eating the fondant pudding – whilst very chocolately, the centre was cooked through with no “goo-y-ness”. I mentioned this to the waiter, who immediately apologised and said they will bring another out. Someone came over and explained this was brand new on the menu. They tried it yesterday and enjoyed the fondant – perhaps a problem with the batch. The next one was brought out, and unfortunately the same issue. So, I asked for the sticky toffee pudding instead. What a great second choice – so much sauce, I must have been overloaded with sugar after eating it. The pudding and ice cream were good. Probably one of the best sticky toffee puddings I’ve had. So, a conclusion. The Lord Northbrook served a good Sunday lunch. Whilst Claire didn’t like the beef , she enjoyed the rest of her dish (and had a slice of my lamb to compensate). I personally thought the beef was excellent, very tender. I didn’t like the puréed vegetables, but Claire did. The potatoes were good, as was the yorkshire. One thing – there didn’t seem to be much seasoning / flavouring with the Sunday roast – I would have preferred perhaps garlic and rosemary potatoes, or something with the meat. My dessert was amazing, just a shame the chocolate fondant was overcooked. The service here was great – accommodating and friendly without trying to “up-sell” us to a starter or coffee. And, so popular with families, this is one I can definitely recommend to our friends with babies and young children. If you come to The Lord Northbrook, make sure you order the fondant and let me know how good it was. 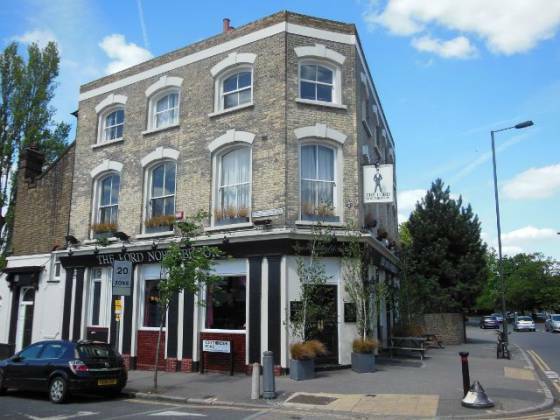 So, overall, a strong Sunday lunch with excellent service at The Lord Northbrook, Lee in Lewisham, London.